Numark’s NV is a well-specified software controller for Serato DJ with a killer addition: Two full-colour screens, aiming to help you hide the laptop way out of sight. Numark’s made a bit of a shout about the NV being a revolution in DJing. “This changes everything”, no less. I’m going to cut to the chase here: It’s a pretty decent four-channel Serato DJ controller, but with one killer addition: two full-colour screens. I say “killer” because after playing with it for a few days, it’s simply impossible to imagine this kind of feature not being built into all mid to high-end DJ controllers within the next year or two. Indeed, we already know Native Instruments is about to launch something similar; surely the rest of the pack won’t be far behind. So yes, it’s a revolution, and Numark started it, no question. However, there are questions to ask. How good are those screens? 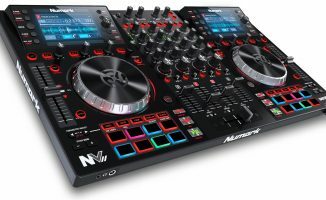 How much do they add to the experience of DJing with the Numark NV? How well do their functions integrate with the software? And can you really tuck your laptop off out of sight, unopened, letting you DJ with this with this just like CD and vinyl DJs do, eyes 100% on the gear at your fingertips and the audience in front of you? That’s what we find out today. But first, though, let’s take a closer look at the unit itself. It’s a curious mix of Numark’s cheaper and more expensive controllers. Made mainly out of plastic like the Mixtrack-level devices, it has the component quality of devices like the Numark NS6 and especially the Numark NS7II. 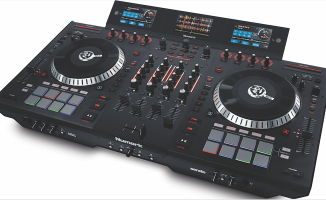 It’s a mid-sized controller, shallower but slightly wider than the Traktor Kontrol S4, for instance, and while the pitch sliders are really long, the jogwheels and performance pads are smaller even than the Mixtrack Pro 2. This, of course, is to make room to fit in the screens, which are angled, CDJ-style, towards the user in panels above each jogwheel. The four-channel mixer feels solid with a good replaceable crossfader and fat filter knobs for each channel, and both crossfader start and crossfader assign switches for each channel too. The unit is pleasingly thin, only the small silver jogwheels feeling “chunky”, being higher in profile than the low-slung versions on Numark’s own Mixtrack controllers and those used by Reloop or Vestax, for instance. The sleekness carries through to the controls on the front, where there are only three; a headphones mix and a split cue (the latter rare in DJ controllers nowadays), plus headphones volume control. These are on the right-hand side of the front edge of the unit, with the 1/4″ and 1/8″ headphones sockets themselves being on the front left. While there are limited inputs, the unit has pro XLR and both booth and master RCA outputs. Looking around the back, it becomes clear that the four-channel mixer on the NV is purely for software, as there are no inputs for a pair of CDJs or record decks, so this can’t be used with Serato DVS, for instance; the inputs are limited to a mic channel (1/4″ TRS, unhelpfully with the socket on the rear), and a twin RCA aux, switchable with the mix channel. There’s a one-knob tone control for the mix (only) and a volume knob to adjust the overall volume of this input, but it goes straight to the output (ie not via the software) and so is really best used for the odd bit of talking, or for a backup channel. 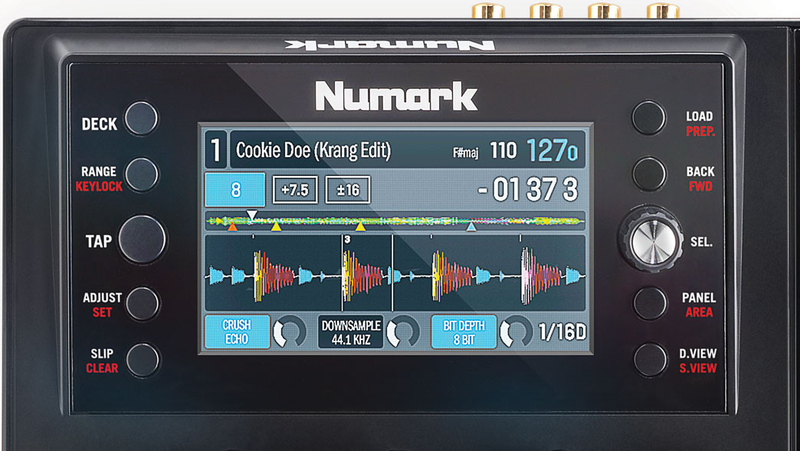 Mobile DJs needing a more flexible mic arrangement and DJs wanting a versatile unit to sit at the heard of a hybrid analogue/digital set-up will need to go elsewhere, though, and clearly Numark has deemed that most potential buyers are neither of these things (probably rightly). There are booth and master RCA outs, though, and the latter also gets a pair of balanced XLRs. 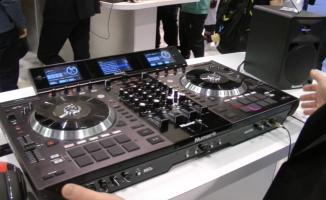 As I said earlier, the unit is a curious mix of cheaper and more expensive Numark gear, but the overall impression – given by the great crossfader, split cue on the headphones, touch-sensitive knobs (more on those later), full Serato feature set, XLR/booth outputs, and of course those groundbreaking screens – is one of a decent mid-range device, with just enough Numark pro features cherry-picked from further up the chain to make it a serious proposition for all but the most demanding software DJs. Bright, with a good viewing angle, the screens are very good. We tested them in a studio and a dimly lit DJ booth and found them totally easy to view in all situations. The two screens are full colour, bright, have a wide viewing angle, and overall look fantastic. The resolution is the same as most desktop computers (ie it’s not Retina or similar), but it’s good enough. They are plastic fronted and they bend a bit on touching them which was a little disappointing; I’d have preferred them to be more rigid with a thicker plastic or even a glass front; but actually, as they’re not touchscreens at all, you’re never going to be touching them anyway – but for sure people will try! There are five controls on each said of the screens; to the left are five buttons to select the deck being controlled/viewed, beatgridding, tempo slider range and key lock, the controls to the right covering track selection and loading, folder navigation, and what is showing on the screen. You can also switch views on the “main” screen, i.e. your laptop, from here, if you choose to keep that in view as well. 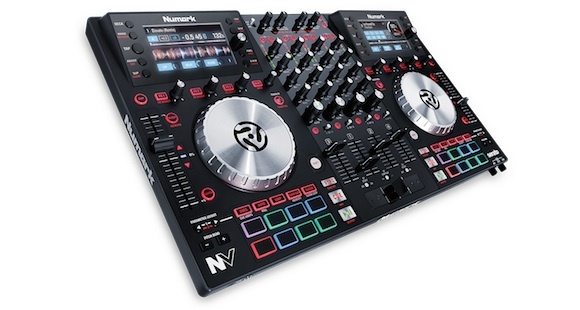 The main view – the one you see on powering up the unit – tells you the selected deck, the loaded track info, and gives you the familiar Serato disc that spins when playing and that has a cue marker on it to help you when scratching, as well as the time remaining and the BPM displayed within it. As well as this information, you get a basic full-track waveform and info on which effects are selected and whether they-re on or off. This is actually great, as it shows you at a glance how you’re set up, and it’s doubly good when you have a single effect selected, as the screen then names the parameters that the second and sometimes third knob are controlling – info that is all the more useful as it’s right next to the controls (the FX knobs and buttons are of course right under the screen). A small number tells you what cycle the beat control is set to. The waveforms are classic Serato and move smoothly with all the same colour feedback you get on the software screen. Pressing the view switch button takes you to the second screen, that retains track info at the top and FX setting at the bottom, but now shows you the big Serato waveform as well as the “full track” smaller version. This is the view I found myself defaulting to as I like to use that info when setting loops and so on, and for cueing. Of course, with two small screens you don’t get parallel waveforms and if you use those for helping with your beatmatching you may think you’d miss them, but Numark has added a set of horizontal LEDs at the top of the mixer that works a bit like the phase meter in Traktor, effectively showing you which track is pulling ahead of which, so all is not lost here. The third screen shows you the library browser, which displays the track title, artist and BPM and lets you scroll easily through the current folder or switch to another folder, and load tracks onto decks. For me, this is the weakest part of the current firmware as there is no way of seeing genre, key or comments, or sorting – essentials for me in my DJing. The way around this would be to categorise your tunes using the tags that are important to you in folders ahead of time, so you know you’re in the “house” folder (for instance). While I don’t think there’s anything wrong with finding a workflow that works around the limitations of your gear, this is a limitation I’d like to see fixed in a future update. As far as the sorting issue goes, Numark has assured me it is “coming in an update”. Good – it needs to be. 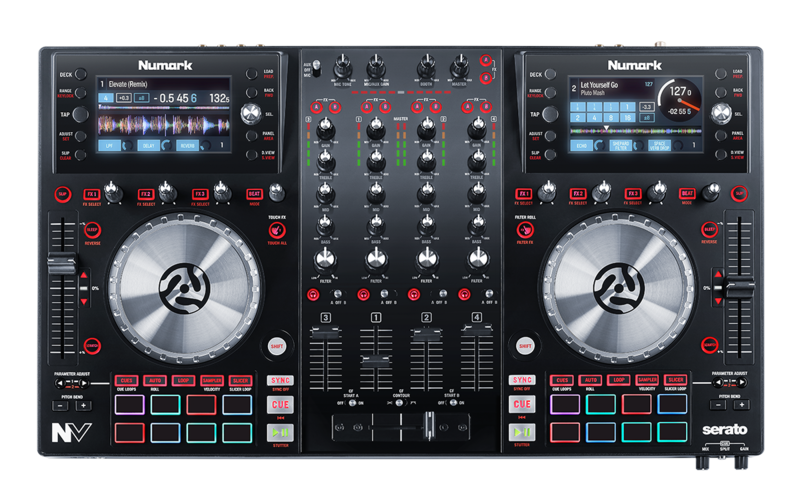 Another slightly weird usability issue is the fact that Serato only actually has “one” library view, but the Numark NV has two screens. So if both screens are set to library view and you scroll on one, you see the same thing happening on the other. This isn’t a big deal, and you can totally understand why this is so when you think about it (it would be hard or impossible for Numark’s engineers to have done things any other way) but it is undeniably weird in practice. I’d love to have seen the ability to “leave” the library view on one screen in one folder and head off using the other screen to another folder to find something else to play, and the ability to load to any deck from each screen; that way you could have your sample library open on one screen and your main playlist on the other, for instance. 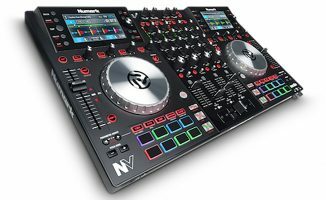 It’s not all about the screens; in borrowing some of the features of Numark’s higher-end DJ controllers, the NV packs a decent amount of DJing functionality, too. OK, so let’s take a quick tour of the rest of this unit, as there is plenty to shout about. The performance pads, while small, are Akai Pro quality, velocity sensitive (on the velocity sampler setting) and full RGB. They are quite small but I didn’t mind that; they’re plenty big enough for what they do. All the advanced Serato functions are here including Slicer and Flip, the latter having an add-on licence in the box for the first 5000 units so you don’t need to buy it separately (the unit comes with the full version of Serato DJ, of course, plus a full set of EDM-friendly Toolroom Records loops and samples). As well as that there are auto a manual loops, loop roll, sampler, eight cues per channel, and so on – all the stuff on other decent Serato controllers, basically. Away from the pads, features like censor and slip mode are present and correct from Serato, and from Numark’s side, the filter roll, filter FX and touch FX settings have trickled down from the NS7II. 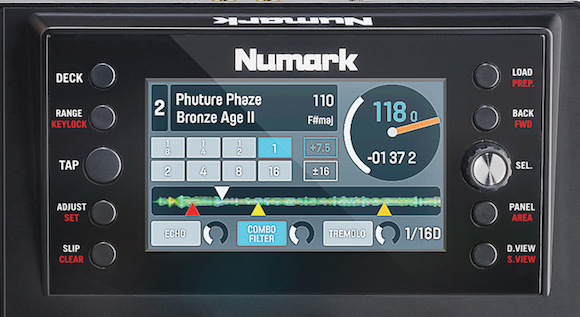 You can read more about all of these in our Numark NS7II review, but in short, Filter FX adds a filter to FX and rolls progressively to bring a new dimension to those functions, and Touch FX / Touch All lets you enable FX and/or EQ kills by simply touching the knobs lightly. Personally, having touch kills on the EQs is a great addition here (I used to love them on hardware mixers, and missed them as they fell out of fashion on digital gear). Many older DJs will also enjoy the return of split cueing (it again used to be common on hardware mixers, and helps you cue in your headphones when there’s no decent monitor in the booth). The big fat filters feel great to use, and for scratch DJs, there’s a contour switch to change the crossfader from a smooth to a cut setting. Firstly, the value you’re getting here is amazing. The controller is specified like the best digital controllers out there, then they added two highly useful, full-colour screens that work extremely well and frankly change the game completely if you so wish. Of course, they’ve stripped out all analogue mixer functions so it’s a strictly software device save for an extremely basic mic/aux channel, but that’s how it’s the price it is. This slimline software controller doesn’t get everything right, but for the price and for the revolution of having colour onboard screens to help you escape the laptop when you perform, it gets our thorough recommendation. It’s not perfect; I found the small, five-bar VU meters disappointing, and would really expect to be able to see key and genre at least in the browser columns; I can see an NS6II or NS7III down the line with bigger screens, hardware inputs back again, maybe touch control on those screens, and thus some of these limitations being fixed. But I want to bring you back to how I opened this review: Can you DJ with your laptop tucked away, and how does that change things? I can report to you that most certainly: Yes you can. What’s more, once you get used to doing it, it feels like freedom. I love laptop DJing and I love having all that info on a gorgeous big screen in front of me. Conversely, personally, while I truly dislike using CDJs (despite their advances, it just doesn’t feel as flexible or fun to me as using software), I understand how it just looks better to the audience having a DJ with no screen. The Numark NV truly appears to have hit on a decent compromise. Frankly, if they only manage to sort out the one issue with not enough track info in the library (they’ve assured us the inability to sort by column is already “coming in an update”, so we’ll trust them on that one), they’ll have it just about perfect. As it is, it’s a very, very good start, and great value too. Overall, we’re suitably impressed; frankly, even if it didn’t have the screens it’d be a decent controller; with them, it’s another game entirely. How does it look to you, then? Can you see yourself hiding your laptop out of reach and DJing with just you, your crowd, and your NV? Or do you think it’s a weird hybrid and should have the computer actually built in, too? Please share your thoughts in the comments. Now that this is out, Pioneer will surely come up with their own version…LOL. Can you change the sort on the library list, for instance to sort based on bpm? It is coming in an update, say Numark. Ticks almost all of the boxes for me, channel gain knobs, long pitch faders, split cue, nice piece of kit. For a first effort on a controller with screens, they’ve done very very well. Be fascinating to see the battle of Christmas 2014 between this and the Native Instruments S8, some real choices there. Your enthusiasm on this review is infectious Phil, you’re buzzing! Phil, can you tell us about the pitch faders? They are long throw but are they 14 bit or like the long throw low res ones like Gemini use? I’m very tempted to buy this, but can’t find out about the pitch faders. 14-bit I’d guess, they are very accurate. Yeah, I’d looked at that, and even asked Numark on their FB page. They said, “They’re great!” which wasn’t quite the level of detail I’d wanted to hear 😉 Was getting a bit suspicious as everyone has been distracted by the screens and the pads and stuff, have yet to see a video of anyone even touching the pitch faders… probably me just being out of date lol. Thanks! Long throw and accurate, that’s probably me sold. and the tops are touch activating like the NS7-2….. which is a bonus in my book. So… this might be a stupid question but am I right saying that it kind of looks as if the laptop isn’t much more than a USB-Drive with my music library in it? (Except it has to handle the software, but I could see that beeing built into the controller in the future). I’m happy at the fact that Phil truly dislikes using cdj’s. I feel the same way and I’m sure thousands if not millions feel that way too when compared to software! Now watcha gonna do Pioneer?. ;)- oh wait, you’re being sold! Hopefully the right owner will improve things fast and cut the unessary over-pricing. But by then, Numark/Reloop/..and so on may have already advanced even further! what are the issues with the mic on this unit phil? im a mobile /club dj is the mic suitable for me on this unit? Mobile DJs tend to want XLR mic inputs with proper EQ, and preferable routable through the mixer and software for applying reverb etc. This is a basic mic channel that doesn’t have those things. There’s no “issue”, though. Thanks Phil so is there no eq on the mic/aux channel? one-knob (ie tone), for mic only (not aux). How are the jogweels in work? Are the FX post-fader? FX are post fader. Jogs are typical Serato (ie perfect). Phil, The jog wheels look small. How do they compare in size to the Traktor Kontrol S4 jog wheels? Phil, I for got to ask, Does the NV jog wheels work better for back spins? I remember when there were no screens at all and all you had were your senses. Now with so much music out there I feel dj’s need a little help and these screens provide another way of getting that info. Right now it does not replace the laptop however it does.lean in the right direction. most DJ have the Laptop on the Side. And the Drum pad up front.. It think this is a fad. Looks great and functional, hope NI builts its own 2 and 4 channel controllers around this concept. Numark have flew this out. It took them years on the concept of the NS7ii, constantly showing it off but taking forever to hit the shelves. I suspect they brought this out as the budget version of the screened controllers to beat NI or any others on release of the concept. What we shall see dropping into the market next year will be true game changers, very excited!!! I’ve been looking to invest in a controller for a while now, but none had ‘split-cue’. This has got me seriously tempted. Other manufacturers take note. It looks awesome and it’s exactly like the reviewer is saying: this one is actually pretty cheap for what you are getting, but let’s wait now for an upgraded version with hardware support, bigger screens, more inputs etc. I do think Pioneer will come up with this one soon. The price will be heavy again (I estimate 3.000 $) and Pioneer will be happy to set the standard again and earn a lot on 1 machine. Looks great and not mahusive like other numark controllers. I agree the only thing that would get me over to pioneer would be rekordbox and USB function the same as the cdjs for a much lower price than buying cdjs and a mixer as this is what I use playing out. I use a Pioneer DDJ-SR at the moment and are very tempted by the idea of the screen. NS7III would be out of my budget as would the Pioneer XDJ-RX. Is the NV comparable to the SR performance wise (other than the platter size) to the SR?? I’d say so, yes. You should get to a store and test for yourself though.